I posted a picture on Instagram a number of weeks ago. We were walking to a Holy Home Visit in Miswa community (one of our Kabwe communities), and one of the siblings we were walking with was carrying a box of food to take to their brother who was sick and unable to come to the care point that day. The situation we found in the home that day really broke my heart, and I wrestled deeply for days and weeks with what we saw and heard trying to process the injustice, the desperate vulnerability, the hopelessness and pain we saw. It has taken time for me to be able to share about it. This little face has been vivid in my mind…. This is Given*. He is 3 years old. He was the recipient of that box of food the day we visited. We found him outside the home we were visiting, just laying listlessly on an old mattress. When we found him, he had been sick that way for 2 weeks, and his legs were paralysed from the illness, making him unable to walk. He was just able to sit, but mostly just lie down. He was one of 10 children and grandchildren being cared for solely by Gogo (Grandmother) Nester*. We sat and heard her share how she had struggled and pushed to get Given to the clinic 2 times for treatment, and he had taken 2 courses of treatment for Malaria, but he was still very sick. Each of these efforts had taken all the effort she could muster, to get him help, and yet seemingly there had been no change. You could hear the hopelessness in her voice as she had all but almost given up, that there could be any change in this situation. I found my mind running away to envision the life of Given, in this deep rural community, and the challenges he would have to face if he did not recover use of his legs. In trying to imagine his life, I quickly concluded that the future would be almost non-existent, or near impossible…he just wouldn’t make it. It is tough enough in this community to get by as an able bodied person. The only real way to get by is to live off the land farming enough to live off. 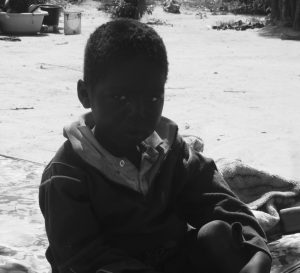 I felt the darkness of a very bleak future, and at the same time felt compelled that something must be done to help Gogo Nester continue to fight for this child. On the 45 minute walk back to the Care Point, I was quietly wrestling in my heart with what could be done in this situation. Knowing how far the nearest clinic was…too far to walk to, I was thinking about bundling this child up into the vehicle we had come with and rushing him to the hospital for further treatment. I was in my “western thinking” problem solve mode, that even after all these years still comes ever so naturally! But what I love about Hands at Work, and who we are, one of our core values is Local Community ownership. And what happened next was so beautiful, but could have so easily been ruined by my best intentions. When back at the Care Point, we sat with all the Care Workers to debrief on our holy home visits. We shared the story of Given, and I felt we should push and not leave that place until something had been done to intervene in his situation. Stephen, a member of our local office in Kabwe, supporting Miswa community, led our time together with the Care Workers, as he challenged them to agree on what were the next steps that could be taken in this situation to care for Given. We were not leaving until there was a plan! At first it was very quiet, and we sat in silence. If I am honest, I was doubting these Care Workers could come up with a good solution. Then finally the silence broke. One of the Care Workers offered that he could take Given on his bike to the hospital on Monday (when he was planning his next visit to town). It was Thursday. I really appreciated the way Stephen took this feedback, and then counted on his fingers. “Today is Thursday, then there is Friday, Saturday, Sunday and then Monday. That’s 4 days. Can Given really wait 4 more days to get to the hospital?” The challenge was out there. There was silence again, and then the Care Workers finally agreed that was not good enough. I think it probably took 30-40 minutes of wrestling out the problem with the Care Workers (while I was careful to hold my tongue and just watch), and eventually we had a plan that he would be taken to the clinic by the Care Workers the next day. Fast forward around 4 weeks, and I believe 2 more visits in that time for Given to go to the hospital for treatment, and he is once again a happy, healthy 3 year old boy. And he is walking! Thanks to the commitment of the Care Workers, and answer to the many prayers. This is the power of local community ownership and the goodness and faithfulness of God. In fact, it has been a really bad malaria season this year, and Miswa community has been hit particularly hard. In recent weeks the Care Workers have subsequently taken many additional children to the hospital for treatment, and we are making plans for prevention with a roll out of mosquito nets. There really is power in fighting and caring for the one. As the Care Workers learnt to care for Given in his time of need, and sacrificed time and resource to do so, there is a learning to care for others in the same way. And we have seen this spill over into the lives of many other children they are caring for just in the past month alone. The growth we have seen in these Care Workers is what makes our work on the ground every day absolutely worth it. Empowering local communities to care and take responsibility for their own. I am deeply encouraged and so thankful. The one is worth fighting for, and local community ownership really is the only long term sustainable solution. I very much look forward to playing and running around with Given again on my next visit to this community!